How dorky is it that I still get a kick out of finding issues of Vice magazine? Maybe it's because the last couple of times have been just as I ran out of other time-killing reading material. Such as this afternoon on the bus back from campus. I'd only taken one of the giant stack of magazines with me, finished reading it (such as one actually reads Spin) and there, across the aisle, next to a recently vacated seat was a copy of the food issue. 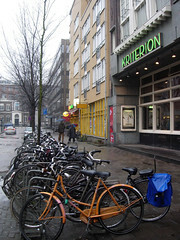 And a couple of weeks ago, I think maybe I'd just seen or was waiting to see a movie at Kriterion. Beer and appletart were definitely involved. And there, in the back of the room, were a stack plastic-wrapped copies of volume1, issue1s of the Dutch version of the magazine. Actually, it seemed to be mostly a remix of other U.S. editions because the "guide to you" that introduced "grover" as a body type and the "don't" about the cop in high heels were in it, along with a few articles written in (or translated into) Dutch. Anyway, it's this sort of happiness at random discoveries that makes me think that not paying for a subscription is a good decision. not that dorky. i do too, and i live in new york (where it is apparently more abundant). i think i'm way dorkier!